2014 was been the year of video creation tools & assets for Internet marketing professionals. Several high quality and low cost software packages were introduced during 2014. 2015 has seen continued enhancements of each of these powerful tools. The latest video product upgrade of note is Easy Sketch Pro 3.0. At $97 it is a great value. But if you were proactive enough to have purchased version 1 or version 2, you can get the full power of 3.0 for just $37 — if you act fast during the new product launch. Newcomers can also get version 3.0 for the same price, just not with the upsells included. Paul Lynch, the British marketing pro behind Easy Sketch Pro, is rewarding past customers with those extra features at no added cost. Video has long been recognized as a strong marketing tool. Television has certainly conditioned all consumers to take notice and react to video presentations. While video is not exactly new to the Internet, what is remarkable and new is the facility and economy by which video presentations for the Internet can now be produced. The importance of video as a marketing tool cannot be overstated, conservatively estimated to be over 150% more effective in converting than non-video presentations. 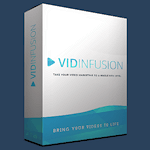 Three major video creation tools were released to the Internet Marketing community during 2014. First was Video Maker FX developed by Peter Roszak, launched May 5, 2014. The market acceptance for this product has been astounding, with over 27,500 copies of the software sold within the first six months of its release. It quickly rose to the #1 top sellers on JV Zoo and held that position throughout its launch period. Even now, over 6 months later, VMFX still often ranks among the top ten products on JV Zoo. Several related products were included in the sales funnel, with total sales exceeding 71,000 copies. Second was Easy Sketch Pro developed by Andrew Fox and Paul Lynch. This product actually saw two major releases during 2014, first in June 1 as Easy Sketch Pro and Easy Sketch Pro 2 launched on November 4th. The second release added several enhancements, most notably the ability to incorporate full motion movie clips into whiteboard sketch videos. It can grab the opening scene of a video to create a whiteboard sketch. Then the sketch comes to life to reveal the movie. This is an effect that mesmerizes audiences, and is unavailable in any of the other video creation software packages discussed here. 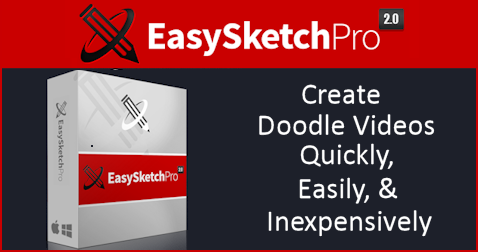 In 2015 Easy Sketch Pro 3.0 added even more exciting features. Third on the scene, released November 11, 2014, was Explaindio. At first blush this may seem to be simply a combination of the features of Video Maker FX and Easy Sketch Pro. It is that, and more. If you are only going to use one video creation program, I think I’d have to recommend Explaindio for the job.But that endorsement should not stand in the way of using the others too. 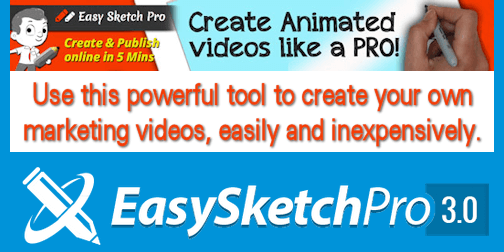 I have personally worked with Video Maker FX, Easy Sketch Pro and Explaindio. Each of these 3 products has its own strengths and weaknesses. It is impossible to honestly say either one is better than the other, any more than to say one type of screwdriver in your toolbox is better than another. Just as any construction project may call for multiple tools, and different screwdrivers, so it is with these video creation tools. My advice is to own and utilize all three. Your finished video project may utilize elements created by each of these products. In addition to the video creation software itself, one needs a variety of graphic elements — the hand drawn images and animated slides used within the videos produced. Each software package discussed above includes a generous supply of these assets. Supplementary graphics packages are also available, either from the software developers or third parties. 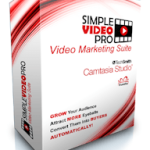 Several supplemental video graphic packages have been brought to market on the coat tails of the several video creation tools launched during 2014. Explaindio, LLC offers their “Mega Video Assets Pack” which includes over 500 additional sketch images and 88 more animated slides compatible with Explaindio. And if that is not enough to satisfy your thirst for graphics, they even offer a monthly subscription that will continuously add to your collection. Third party graphic artists have also jumped in to develop professional SVG images that are compatible with each of these video creation programs. SVG images are scalable without pixelation or loss in quality. In fact SVG stands for Scalable Vector Graphics, and is an image format developed by the World Wide Web Consortium for two dimensional graphics with support for animation. These images can be easily resized and manipulated for use by each of these video creation programs. M. R. Sandiegi offers several low cost, high quality SVG image packs. The “All In One SVG Pack Vol 1” includes 200 professionally drawn SVG images, including 30 child activity images, 40 construction worker images, 20 doctor images, 20 office worker images, 10 golfing images, 10 auto mechanic characters, 30 meeting and presentation activity images, wedding related images, and images of musicians and bicyclists. The “SVG Mega Pack For Whiteboard Videos” pack includes 500 SVG images. The “SVG Pack Lite Pack” includes over 130 hand drawn arrows, signs, squares, ovals, charts and characters. The Whiteboard Super Bundle from Eugene Myers is a large collection of color SVG images, including animals, arrows, banners, buildings, male and female drawings and cartoon characters, frames, infographics, objects, speech bubbles, backgrounds, and 130 animated images. This bundle even includes 10 royalty free music tracks. Just released on December 14, 2014 is a Giant Whiteboard Kit developed by internationally acclaimed graphic artist Maulana Malik. The video maker software products discussed above feature cartoon like characters or mascots to help keep viewers attention. While each movie maker offers a good variety of characters, there will always be a need for more. So it was inevitable that someone would come to the rescue with software to generate their own custom cartoon assets for videos. Several mascot creators have come to market, but only two seem to have found wide acceptance in the Internet Marketing community. First among these was developed by Maulana Malik with his Mascot Creator Bundles. Volume 1 was introduced on August 20, 2014, priced at just $19.95. 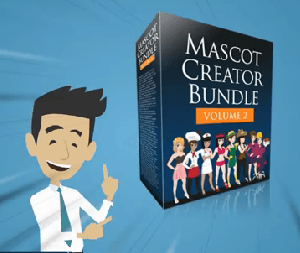 Mascot Creator Bundle Volume 2 was released September 30, 2014, including a library of 530 creative items. Currently priced at a little over $21, this is an amazing bargain. In fact, both volumes offer an incredible value at these prices. We recommend owning both packages, since each feature different mascot characters and other graphics. Next on the scene is Jovana Sumar’s Mascot.ly This amazing software was released on November 24, 2014, and quickly found its way to the top ten list of software releases on JVZoo. In a matter of hours 500 copies were sold. The product is not only a bargain at $37, but it comes with some outstanding bonuses that are worth hundreds more. The price will be going up, of course, so wisdom dictates that you should jump on this opportunity quickly. I created the accompanying young lady image using Mascot.ly in just a few minutes. 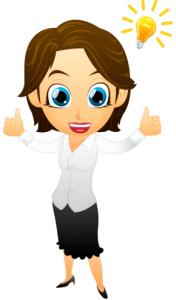 She and I both give this product two thumbs up! The images created by the Mascot.ly software can be imported to Explaindio or Video Maker FX, or used in any number of other printed documents, PDFs, or even Tee shirts. Read more about it in our Mascot.ly product review. Background audio tunes and loops are also included with each of these programs, but here again third parties have stepped forward to offer a broad variety of audio assets. Music touches the spirit in important ways, and there is a great variety music available from highly talented artists. Finding just the right tune for your video is an art in itself, setting a mood that is consistent with the message of your video, without being overpowering. My personal tastes in music cover a wide range, but video background music tracks are a special breed. Most of what is available on the market today is, in my humble opinion, just too over-powering, too heavy for our purposes in creating marketing videos. Marian Krajcovic offers a package of 101 Professional MP3 Music Tracks for use in your videos, currently priced for pennies each, currently priced under $10 for the lot. At that price, frankly, if you can find even one that is suitable for your video, it is a bargain. I do like several of the tunes in this package. My biggest complaint about those I like, is that they are a little on the short side if your video is much more than a minute or two. Of the selections I chose, the times run from just over 1 minute to 2:44. Done right, it seems to me, video background tracks should be laid down in multiple lengths, or better yet, cut in such a way that they could be looped indefinitely to match the length of your video. Both Maulana Malik and Jovana Sumar include bonus material with their mascot creator software that include lots of additional MP3 music tracks. One of the problems with videos is it has historically been difficult to incorporate navigation links within them. Often we see great videos on YouTube, that spark our interest for a particular company, service, or product, but we are left hanging in terms of being able to get to the website where these things are featured. It would be really nice to be able to embed navigation links right inside the video, making it easy for viewers to interact with our videos. This is now possible through several means, but it requires use of special magic, or even special video players. Our friend Ray Lane has reduced this mysterious magic to an inexpensive tutorial he calls YouTube Interactive, which he is offering for just $10. It is worth every dime of that, as it includes graphic buttons that can be incorporated into your videos as hyperlinks. Another way of doing this sort of thing is with video players from Easy Web Video, VidInfusion, or Simple Video Pro. To summarize, if you are at all serious about producing videos to promote your business or that of your clients, you should have all of the above mentioned video creation tools in your arsenal.